OK, so you're buying a retina display MacBook Pro. Let's look past the fact that a maxed-out MacBook Air is probably enough for most regular people, or that if you order a new retina MBP today you'll have to wait a month until it arrives. Let's figure this thing out! 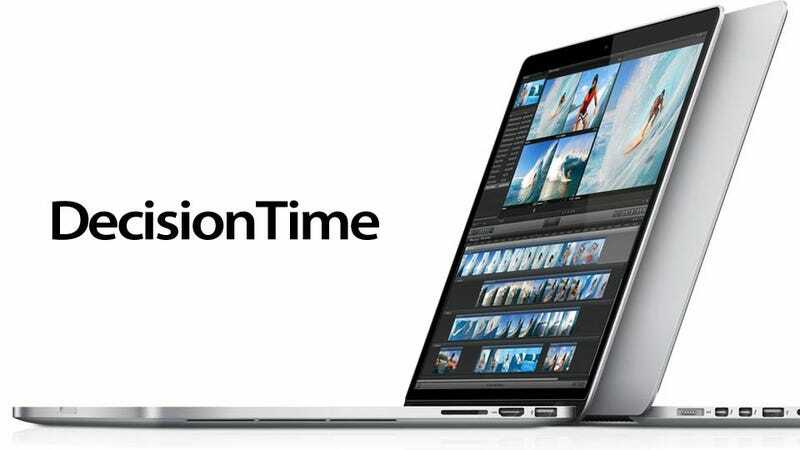 Now, not to belabor the point, but if you're a regular person who isn't going to be doing much rendering or high-end editing, you can probably get by with a MacBook Air with a dual-core Ivy Bridge processor and 8GB of RAM. Probably. So what you're looking at here, really, is some more oomf in your Diablo 3 runs with the discrete Nvidia video card and that beautiful, beautiful retina screen. In that case? You want the 2.3GHz 16GB RAM 256GB SSD model for $2400. Here's why: SSD storage is precious, and precious is expensive. But increasingly, you don't need a ton of space on your drive. Cloud storage like Dropbox, Google Drive, and Skydrive helps, and dovetails with better and better mobile internet options, like tethering LTE phones, or 4G dongles. And if you're thinking about your massive not-on-Rdio-or-Spotify music collection, or all those torrented movie files that aren't up on Netflix and you can't do without, well, you're just as well off sticking them on a USB 3.0 94007200RPM external hard drive. Why? Spinning drives are actually faster than SSDs for mass media archives. And the RAM? Well, it's soldered on there, so you've got to decide now. And $200 for the bump from 8GB to 16 isn't bad at all. Memory is one of the things that will give you actual, tangible benefits day-to-day. If you're an actual professional user who doesn't mind losing out on the optical drive (NBD) or the ethernet port (actually a kinda big deal), you may as well max out with the 2.7GHz 16GB RAM 768GB SSD model. While Apple's configuration markups have been pretty egregious in the past, they are pretty much in line with the market now. $500 to jump to 768GB internal SSD storage? Yeah, about right. Maybe shy away from the $250 0.1GHZ upgrade to 2.7GHz, which takes you down to $3500. Of course, all of the retina display MBP configurations are shipping with three-four week delays right now, so you've got some time to think it over.